Awards and accolades are always special in the workplace. They motivate employees to complete their work with great efficiency. In Gamescope, we give trophies and badges when players complete different levels. The users can edit the points for the default trophies and badges available in Gamescope and also customize them as and when needed. Navigate to Home and click near Notifications in the upper right corner. Click Gamescope in User Preferences. Click the toggle switch to turn it ON, if the feature is switched off. You will see the configuration page for trophies and badges after Gamescope is turned on. A trophy is won for a game. A badge is won for an entity like a task or a bug. It can be claimed only for games currently running. It can be claimed even when a game is not running. It is given only after a game gets over. It is given as and when the specific entity rules are met. The player or team with the highest score bags the trophy. Everyone who meets the badge criteria gets a badge. No points are given if unassigned tasks or bugs are resolved. 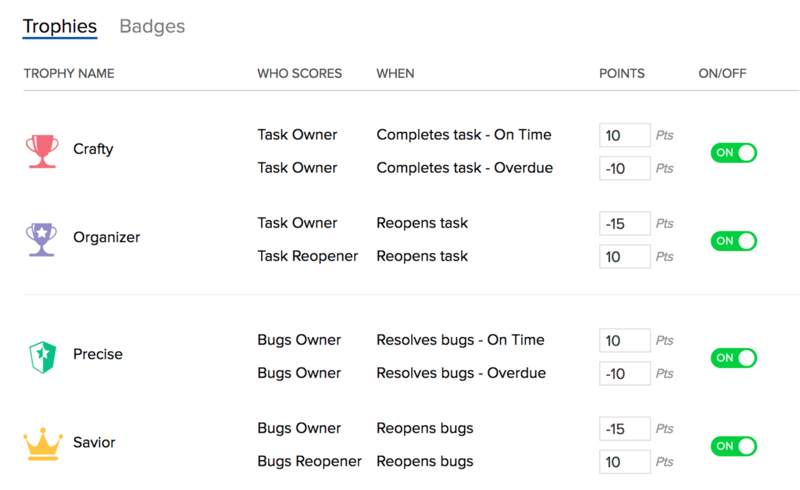 Points are scored if unassigned tasks or bugs are resolved. Trophies and Badges are independent. Whenever you win a trophy or a badge, the respective status will be updated in your feed. Trophy is the reward given to the winning team or the best player.The player who completes a task on time will be awarded more points than the one who takes more time. Navigate to Home and click near Notification in the upper right corner. Edit the points and click to update the points in Trophies. Zoho Projects provides six default trophies. Here's how the rules are set for the default trophies. You can also turn-off the trophy if required. Once a trophy is turned-off, no one will be able to play for that trophy. However, you cannot turn-off a trophy for a game that is in progress. You can add and configure any number of custom trophies to suit your business needs. Click in Custom Trophies to add a new custom trophy. Enter the trophy details and if required, add the criterion to trigger specific actions. You can add trophy details such as, if the trophy is for Tasks or bugs, add points, and choose your trophy. You can set criteria like, adding points only when a task is completed in a selected project. And you can delete the criteria if required. Click Save to customize the trophy. Hover over the required trophy and click Edit in Custom Trophies. Modify the custom trophy details and then click Update to save the changes. You can acknowledge your players based on their level of contribution with the various badges.You can set rules like, "If a person completes 5 tasks in 1 hour, he or she will earn a badge".Zoho Projects provides four default badges. Also, badges can be edited and configured to suit your projects but cannot be deleted. Click Badges, set the Count, and enter the Duration for the task and bug entities, and then click to update. Here's how the rules are set for the default badges. Taskminator: The one who completes the most number of tasks as decided by the admin gets this badge. Taskmaster: The one who adds the most number of tasks as decided by the admin gets this badge. Bugminator: The one who resolves the most number of bugs as decided by the admin gets this badge. Bugwinner: The one who finds the most number of bugs as decided by the admin gets this badge. You can add and configure any number of custom badges to suit your business needs. Click in Custom Badges to add a new custom badge. Enter the badge details such as badge name, count, duration and so on. And if required, add the criterion to trigger specific actions. Click Save to customize the badge. Hover over the required badge in Custom Badges and click Edit. Modify the custom badge details and then click Update to save the changes.